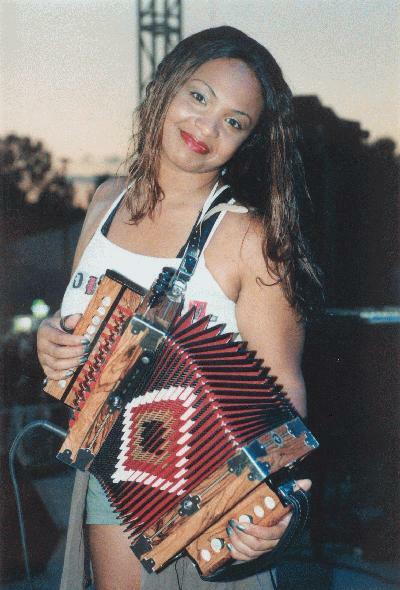 Accordionist, Singer and Songwriter, Rosie Ledet IS the Zydeco Sweetheart. But, make no mistake, there’s nothing sweet about the way she can rock and roll with her diatonic accordion. Yes, that’s what I said….the accordion. She is quite unique among accordionists, of any stripe. But if Zydeco is a man’s world, and if the accordion is a major part of that world, then they both need Rosie Ledet, with her sass, style and all that swag that goes with it to make it all the more exciting. Born in the small Louisiana town of Iota, Rosie came late to the accordion. As a teenage bride of 17, Rosie began to study the diatonic accordion on her own, with the guidance of her musician-husband, Morris. The couple decided that they would both pursue music as a full time career. With Morris Ledet as producer and bassist, the couple has been performing, writing and touring with their hot back up band, The Zydeco Playboys, throughout the 1990’s to the present. Travelling throughout the U.S., Canada and Europe, Rosie Ledet and The Zydeco Playboys bring their own brand of Contemporary Zydeco to the U.S., North America and to the world. Rosie Ledet’s method of playing the accordion is very percussive, with both heart and guts behind her moves to show she is not about being shy with her instrument. Influenced by Santana and ZZ Top, among others, Rosie leans heavily on those influences, applying them to traditional Zydeco music, to create a different spin. Add a little Etta James, some definite Louisiana blues influences and her own French Creole heritage, Rosie Ledet presents an interesting mix of styles in her sultry voice. With ten albums to their credit since the Ledet’s began performing together, Rosie has written nearly all songs that she sings. Hardworking Musician/Performers who are also Singer/Songwriters bring to the table a weighty amount of credibility, and Rosie Ledet is no exception. She has opened for Bob Dylan at the Newport Folk Festival, and performed with the late James Brown among many other great musicians. Appearing at festivals and venues large and small she is clearly growing as an artist with her upcoming appearance at Colorado’s prestigious Telluride Jazz Festival in August 2015. Rosie Ledet, with her full, beautiful voice, is coming into her own, as an exciting breakout artist who just happens to play the accordion. Rock our world!